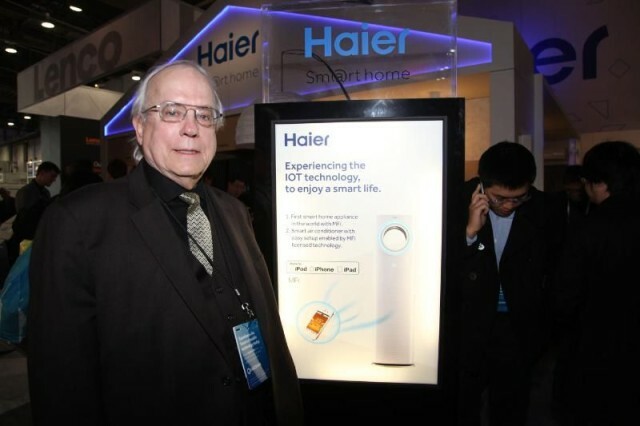 Chinese appliance maker Haier has announced that it has become the first company of its kind to be accepted into Apple’s MFi licensing program, guaranteeing ease-of-use and compatibility with iOS devices. A live CES demonstration showed that Haier’s air conditioner can sync with the iPhone automatically, allowing the user to set up parameters for their air conditioner directly without registration, setup password or any other complicated and time-consuming operations that generally take place when you connect a device to WiFi for the first time. We’ve reported previously on Apple’s MFi licensing program, and how Apple (particularly with iOS 7) has been killing off support for certain unlicensed, third-party peripherals. While there have been air conditioners you control with your iDevice before, Apple’s MFi approval of Haier’s white goods (read: generic term for large domestic electrical goods such as refrigerators and washing machines, which are typically white in color) takes us one step closer to the concept of the integrated home. Forget about the Internet Of Things — this is the iOS Of Things, in which Apple’s ecosystem will try and cover just about every device in your home. Better make sure you remember your Apple ID. It’s likely to become a whole lot more important.